Beautiful, newly renovated, oceanfront condominium set amid towering fir trees provides tranquillity and privacy. Located overlooking the Strait of Georgia in the picturesque area of Yellow Point, British Columbia. Just a 20-minute drive south of Nanaimo and only 90 minutes north of Victoria, you arrive in paradise. Nature at your door with breathtaking ocean views. The condominium can be rented as a hotel unit, a one-bedroom suite, or two-bedroom, two-bathroom suite. The hotel unit is equipped with a queen-size bed, TV/VCR, refrigerator, coffee maker, and small deck. It has a separate entrance but can be combined with the upper level to form a two-bedroom, two-bathroom suite. The upper level contains a full kitchen with deck, dining room, living room with pull-out queen sofa, and separate bedroom with twin beds which convert to a king. We are a Canadian family that loves to travel. 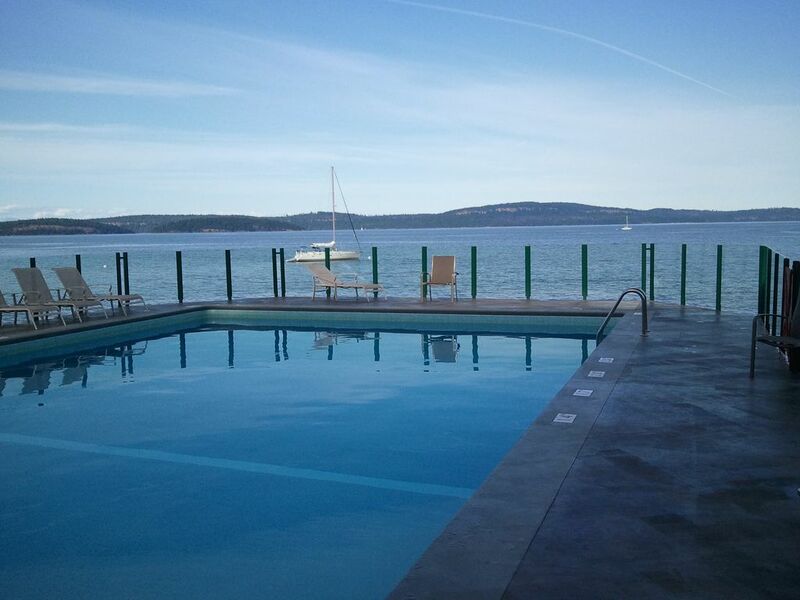 Ocean front complex, heated swimming pool with jacuzzi, tennis courts, deep water dock and 90 minutes from our home so we have an opportunity to enjoy it! Upon arrival, take a moment to unpack then choose from a stroll on the sandstone beach, a vigorous game of tennis, followed by a refreshing swim in the ocean-side pool or a walk in the nearby park. Ease your muscles with a dip in the hot tub. Located just a few minutes away is the Mahle House Gourmet restaurant. If a simpler fare is your taste the local Crow and Gate Pub is renowned for its traditional British dishes. This is a wonderful place to relax and rejuvenate! A great condo for anyone wanting a little getaway!!! I enjoyed my stay very much! Peggy is always on top of everything when it comes to any of her properties. This condo has absolutely everything you will need for a wonderful vacation! The kitchen is very well stocked, lots of dvds, games, books, tv’s in every room, computer, kayaks, washer/dryer ... and the list goes on and on! The decor and ocean view are lovely too! Even though it was cold and rainy, I managed to enjoy the beautiful property and go for many walks. The highlight was Robert’s Memorial Provincial Park which is only 2 km away, and is a nice nature walk to the ocean. Thanks Peggy for a wonderful peaceful little vacation... it’s exactly what I needed!!! Great location. The unit is set up with high end finishing a. It would have been nice if it had been pet friendly. Unfortunately the dishwasher in this unit did not do a great job so most dishes had to be washed by hand. Not a huge deal just an observation. The view was fantastic and the unit was well set up. The bed and pillows were extremely comfortable which made for great sleeps!! Nice way to spend our holiday on the Island. We would definitely stay at Inn of the Sea again!! We had an amazing time. Waking up to the ocean view was wonderful! The condo is spotlessly clean and would recommend it. Everything needed and more besides - games, toys, kayaks ... close to Nanaimo - and you have to visit the crow and gate pub! The condo was clean, spacious, and tastefully decorated. Kitchen was well equipped and bed very comfortable. Great complex with tennis court, volleyball net, playground, pool, hot tub and more ... The condo had tons of games and toys as well as 2 kayaks. And of course the view of the ocean from the floor to ceiling windows was AMAZING! Highly recommend! Wir haben als Gruppe zu dritt das Appartment + Extrazimmer für uns gebucht. Die Buchung war einfach und unkompliziert. Toller Ausblick, voll ausgestattete Küche, ruhig, moderne Heizung (bzw. Klimaanlage - wir waren im Herbst dort), sauber...einfach toll für Selbstverpfleger, die keinen Wert auf Service legen (es kommt niemand, der die Wäsche wechselt oder saubermacht während des Aufenthalts, man muss selbst den Müll wegbringen etc.). Trotz der Lage in 2. Reihe zum Ufer ein fantastischer Blick aufs Wasser, Sonnenaufgänge waren perfekt. Leider können wir die Fotos nicht mit anhängen. Es war die beste Unterkunft unseres 3wöchigen Urlaubs. A wonderful, cozy get away on the water! A great rural location on the water minutes away from Ladysmith & Nanaimo. Close to many local markets, artisans shops, and hiking trails. Quiet and well maintained complex with an oceanfront pool. The condo has recently been renovated and is nicely appointed. Fully equipped kitchen, and a cozy living area with a great east facing ocean view. Wonderful sun rises on the balcony with coffee. Master bedroom downstairs, smaller bedroom upstairs adjacent to the kitchen and living area. Two modern and comfortable bathrooms. A great place to get away from it all and relax with all the comforts. Very clean & well maintained.